Cullen Bunn has been the best thing to happen to bad guys for a while. He managed to create a compelling detective story for Magneto, even putting his own spin on his origin story, and his Sinestro series has turned the character into an actual character, rather than a moustache twirling villain (That is, if you can twirl a pencil moustache). Not to say that Sinestro wasn’t a great character before Bunn got his hands on him, but it would be hard to argue that he’s suffered since getting his own series. 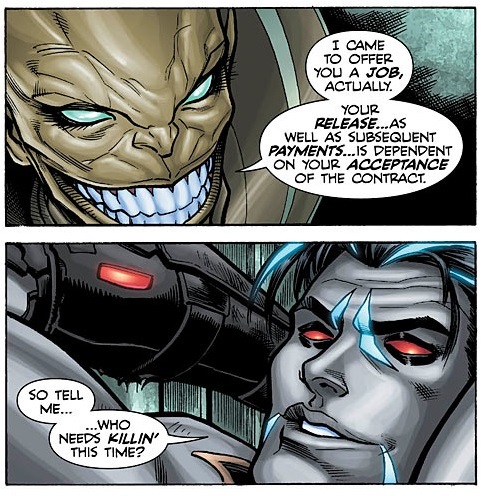 Fun fact, Lobo first appeared in the Green Lantern spinoff The Omega Men. And he has a ‘tache, too. Or rather, did. Lobo’s new design has been fairly contentious. A lot of people have a soft spot for nineties biker design, and perhaps, with the success of Sons of Anarchy, were expecting the design to stick. The new Lobo is slicker, prettier. He wouldn’t look out of place in an anime series. Bunn seems to revel in the disparity between the two designs. The crude Lobo of the nineties has been replaced by an oil painting, open shirt wearing pretty boy. Seriously. But, new looks aside, Bunn’s Lobo is still a Lobo (Which, interestingly, Lobo refers to himself as, A Lobo, rather than just Lobo). The chopper might have been replaced with something that looks suspiciously like it was pinched from General Grievous, but it’s still hyperviolent. The decapitation starts on the cover, and throughout the issue there’s a general disregard for the proper placement of heads. The narration, addressed straight to the reader, coupled with the degree of violence gives Lobo a distinctly Deadpool-ish feel, although without the wackiness. 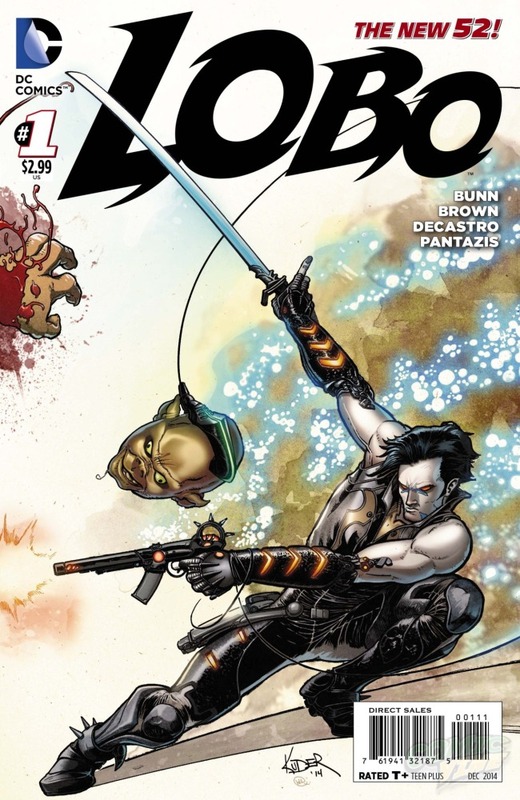 Lobo looks to be a side of DC’s space opera that we don’t often see. 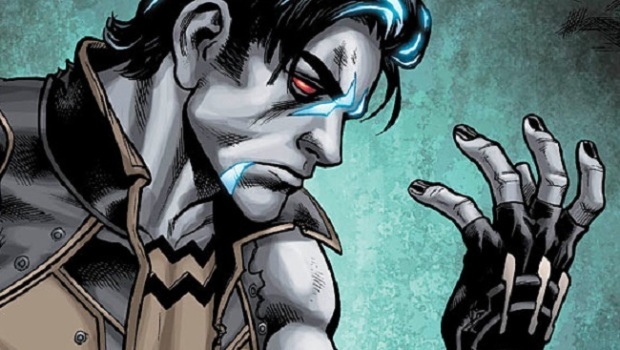 As Green Lantern moves towards the Godhead, Lobo’s focus is on a slightly less epic scale (Although without spoiling anything, the antagonists still have fairly ambitious plans. Whether you’re a fan of the new design or not, Lobo #1 is certainly worth a look if you’re craving some over the top sci-fi action. Whether Bunn can make the new Lobo as compelling a character as he has with his interpretations of Sinestro and Magneto remains to be seen, but if anyone can do it, it’s Cullen Bunn.